The RICE Age is Over, It’s Time to MELT Acute Injuries. The 2018 AFL Season has begun and the first week is over. 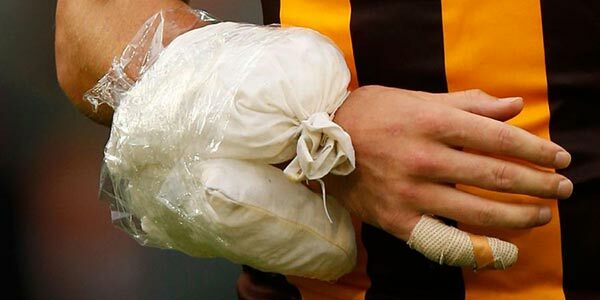 One of the most prominent sports in Australia, footballers being paid $$$,$$$ per year, on multi-million multi-year contracts and yet Ice cubes & packs are still being used on acute injuries. This is the standard of acute musculoskeletal care at the pinnacle of all Australian sports. Dr Gabe Mirikin in his best-selling Sportsmedicine Book in 1978, coined the term RICE (Rest, Ice, Compression, Elevation) for the treatment of athletic injuries, and yet this dogmatic belief and practice still remains in place today. Read what he said in 2015 – http://www.drmirkin.com/fitness/why-ice-delays-recovery.html, quite a different tune. Who missed this? Seems a lot of people did! At Innate Chiropractic we have Banned the use of Ice for any injury. You read right! The only thing it’s good at is “numbing” the pain, the symptom, it does nothing for the cause of the pain! You read right again! Where was the science to make Ice the standard of treatment for injuries? Where is the science today that still makes it the standard of treatment for injuries? If we did apply the science available today, the practice of applying Ice packs for acute injuries should be outlawed, chapters in books rewritten, world wide sports protocols changed overnight. Let us be logical for a moment. When you sustain an injury i.e muscle tear/pull, the body initiates the process of inflammation and swelling is part of this process. Are health professionals asking why this happens, what is the purpose of this? Is this a mistake the body makes in everyday human being on the planet? Did the Body get it wrong? Is this influx of blood, smart or stupid? Smart, when you sustain an injury you want more blood going to that area so the ‘process’ of healing occurs immediately. With more blood, comes red blood cells, bringing healing factors, oxygen and nutrients for healing. This also brings white blood cells to help clean up the area and mop up dead cells and debris, whilst at the same time being on high alert and on call to fight any germs which may have entered if the skin was broken, whilst clotting factors swarm to the site to clot microscopic leaks caused by injury. Again, smart of stupid? Why would you want slow this down or stop this process? Rest – Put this into practice, sit or lie in bed all day for a number of days and don’t move, see how you move following on from this, you be the judge. Ask someone who has had an knee reconstruction in more recent times, patients are now required to move within hours after surgery. Ice – Let’s play the science game – A systemic and Meta analysis, the top of the food chain when it comes to Evidence Based Research, a paper titled – The effect of post-exercises cryotherapy on recovery characteristics – a systematic review and meta-analysis – Concluded: “There was no evidence, that cooling affects any objective recovery variable in a significant way during a 96 hrs recovery period.” Knock yourself out and try to find a ‘body’ of studies that show Objectively (on a cellular level that can be measured), not Subjectively (“my pain has reduced from 8/10 to 5/10”) that ice helps in the acute injury healing process. Spoiler Alert – you’ll find the opposite, it delays healing. You will probably find it may help with pain, but is pain the problem or the injury? Compression – To stop the swelling and aid healing? You are just denying the inevitable basic concepts of healing which will ensure when you take the compression forces off. Ask sports people who have rolled an ankle badly, their foot doesn’t swell while they keep their boots on, they could keep it on for hours with little sign of swelling, but as soon as they take it off, boom, it blows up and the Body goes to work. Elevate – The only correct part the 4 part protocol. However, the amount of clips on tv where athletes are sitting down on the sidelines with ice packs plastic-wrapped over the area of injury that is kept below heart level and gravity is working against them not with them, are the health professionals even following the protocol? Seriously! Have I got your attention now? I am not sorry to turn your world up side down with what you ‘thought’ has been true all your life on how to deal with acute injuries. This is not even controversial, this is Basic Physiology, which you can read in textbooks. What’s controversial is how this RICE protocol has continued for decades both in its full and selective parts. From elite athletes to junior athletes and all in between. It’s Time. Move/Mobilise/Manipulate – this has all got to do with keeping things moving. Movement is what helps minimise the manifestations of the body’s acute injury response and aid healing by keeping those lymphatics vessels working properly. Your lymphatic system relies on muscles contracting and relaxing to pump lymphatic fluid, this system does not have the luxury of the heart, like the circulatory system has, which pumps the blood fluid around the body. Mobilisation/Chiropractic adjustments to help keep those joints mobile and healthy, as well as keeping scar tissue to a minimum following an injury. A healthy joint is one that is mobile. A joint lacking mobility is an unhealthy joint. All joints need movement, that is the purpose of a joint, to move. Elevate – This needs to be done properly. The injured site needs to be kept above heart level as much as possible with circumstances permitting. And here is the biggie – keep moving the injured limb, I.e. if you have rolled your ankle, elevate it and move that ankle, knee and hip. I don’t really care how you move them or in what direction, just move them within your pain tolerance level. This movement ties in with the purpose of the ‘M’ part of the protocol. Laser – specifically Low Level Laser Therapy (LLLT). The modality developed for Russian and used in the American Space programs in the late 70’s and still used today. Have your drink ‘on the rocks’ and keep those ice cubes where they belong. Over 6000 studies on PubMed and no documented side effects in its entire history. Welcome to the 21st century of non invasive healing that works on a cellular level, we are only just getting started in Australia. Laser therapy can be used from immediately after the onset of injury all the way through to human performance. Multi Radiance MR4 Activ is what I use. Tape – Kinesiology Tape to be exact. The elastic properties of kinesiology tape is why this is the tape of choice. It gives functional support while still allowing normal movement. By decompressing the layers of tissue beneath the tape, it allows for better circulation and movement of fluid. Rocktape is what I use. Welcome to Raising the Standard of Musculoskeletal Care – It’s time to MELT acute injuries.